You can add any leftover vegetables into your hash patties to minimise your household food waste. The vegetable crisps will keep in an airtight container at room temperature for up to 1 week. Freeze any extra hash patties in a freezer-proof container, simply defrost and reheat to piping hot before serving. To make this recipe gluten free substitute the flour for gluten free flour. To make this recipe vegan, substitute the egg for vegan cheese and swap the butter for 2tbsp extra virgin olive oil. Peel the potatoes and parsnips then cut into chunks. Place the chunks in a pan of cold, salted water. Bring to the boil and simmer for 15-20 mins until a knife passes through the vegetables easily. Add the broccoli florets for the final 5 mins of cooking. Drain and leave to steam dry for 2 mins before returning to the pan with the butter and mashing until smooth. Meanwhile, on a non-stick baking tray, pat the potato and parsnip peelings dry with a clean tea towel then toss in 1 tbsp olive oil, the cumin and a sprinkle of sea salt. Spread out into a single layer and roast in the oven for 20-25 mins, tossing occasionally, until golden and crisp, then set aside to cool. Reduce the oven temperature to 120C/100C fan/gas 1. Heat 1 tbsp of olive oil in a frying pan over a medium heat the fry the chopped broccoli stem, the spring onion and parsley stalks for 10 mins until softened. Add the garlic and fry for a further 2 mins. Add to the potato and parsnip mix along with the parsley leaves and stir to combine. Season with sea salt and freshly ground black pepper and when cool enough to handle, use lightly floured hands to shape into 8 hash patties. Place on a plate and leave to chill in the fridge for 30 mins. Sprinkle both sides of the hash patties with the flour, shaking off any excess. Heat the remaining oil in a frying pan and working in batches fry the hash patties for 5-6mins on each side until golden and crisp. Transfer to a plate in the oven to keep warm between batches. Bring a large pan of salted water to the boil, reduce to a simmer and gently crack the eggs into the water, one at a time. Leave to poach for 4-5mins until the white is cooked but the yolk is still runny. Carefully remove from the water with a slotted spoon, draining off any excess water. 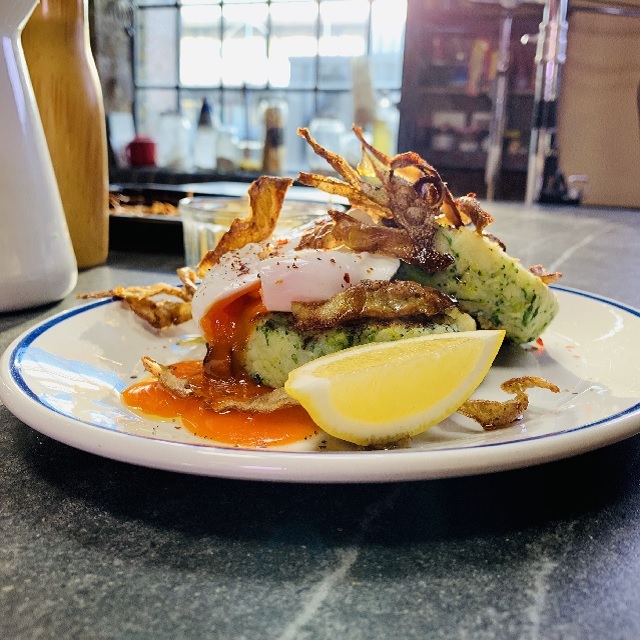 Stack 2 hash patties on top of each other and serve topped with a poached egg and the parsnip and potato crisps. Drizzle with olive oil, sprinkle with the chilli flakes and season with freshly ground black pepper and serve with a wedge of lemon.